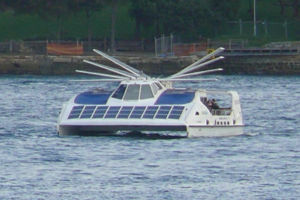 Solar powered ferries currently sailing in Sydney are soon to become a frequent sight in and around Hong Kong's harbour. The ferries use solar panels to power their electrical needs with zero emissions while at berth. Sydney's solar ferries go global, Sydney Morning Herald.